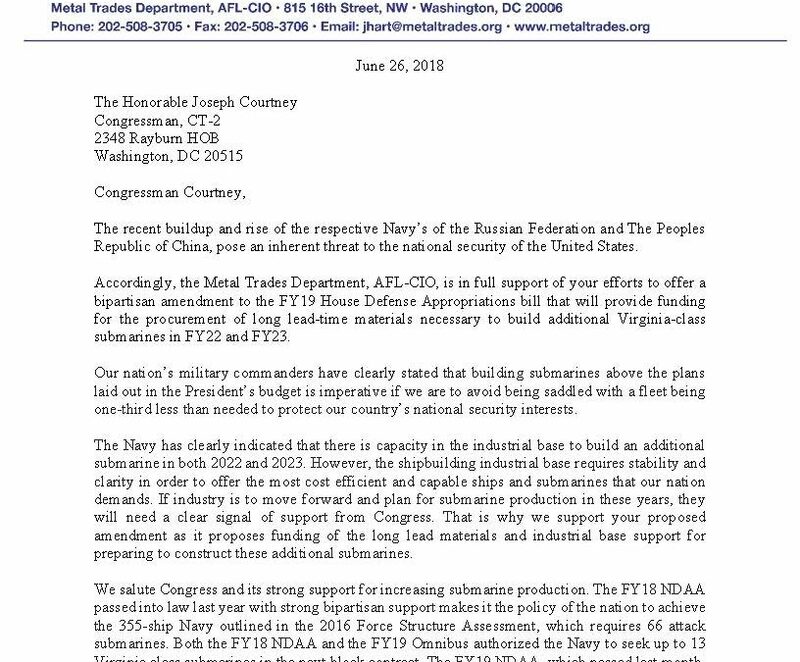 The Metal Trades Department, AFL-CIO, sent a letter of support to Congressman Joseph Courtney (CT) for his efforts to offer a bipartisan amendment to the FY19 House Defense Appropriations bill that will provide funding for the procurement of long lead-time materials necessary to build additional Virginia-class submarines in FY22 and FY23. The recent buildup and rise of the respective Navy’s of the Russian Federation and The Peoples Republic of China, pose an inherent threat to the national security of the United States. 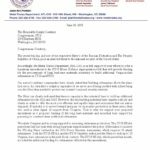 Accordingly, the Metal Trades Department, AFL-CIO, is in full support of your efforts to offer a bipartisan amendment to the FY19 House Defense Appropriations bill that will provide funding for the procurement of long lead-time materials necessary to build additional Virginia-class submarines in FY22 and FY23. 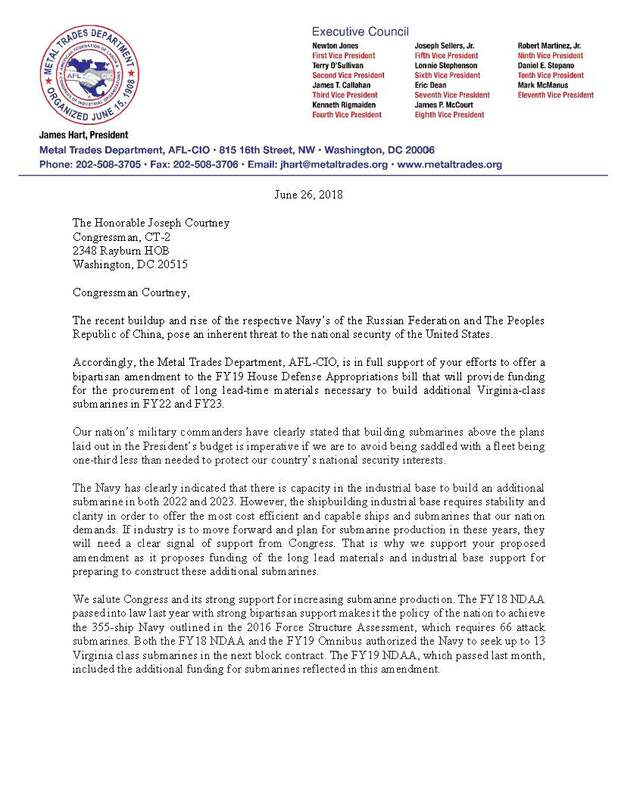 Our nation’s military commanders have clearly stated that building submarines above the plans laid out in the President’s budget is imperative if we are to avoid being saddled with a fleet being one-third less than needed to protect our country’s national security interests. The Navy has clearly indicated that there is capacity in the industrial base to build an additional submarine in both 2022 and 2023. However, the shipbuilding industrial base requires stability and clarity in order to offer the most cost efficient and capable ships and submarines that our nation demands. If industry is to move forward and plan for submarine production in these years, they will need a clear signal of support from Congress. That is why we support your proposed amendment as it proposes funding of the long lead materials and industrial base support for preparing to construct these additional submarines. We salute Congress and its strong support for increasing submarine production. The FY18 NDAA passed into law last year with strong bipartisan support makes it the policy of the nation to achieve the 355-ship Navy outlined in the 2016 Force Structure Assessment, which requires 66 attack submarines. Both the FY18 NDAA and the FY19 Omnibus authorized the Navy to seek up to 13 Virginia class submarines in the next block contract. The FY19 NDAA, which passed last month, included the additional funding for submarines reflected in this amendment. The Senate NDAA has also included additional funding for helping achieve increased attack submarine production. 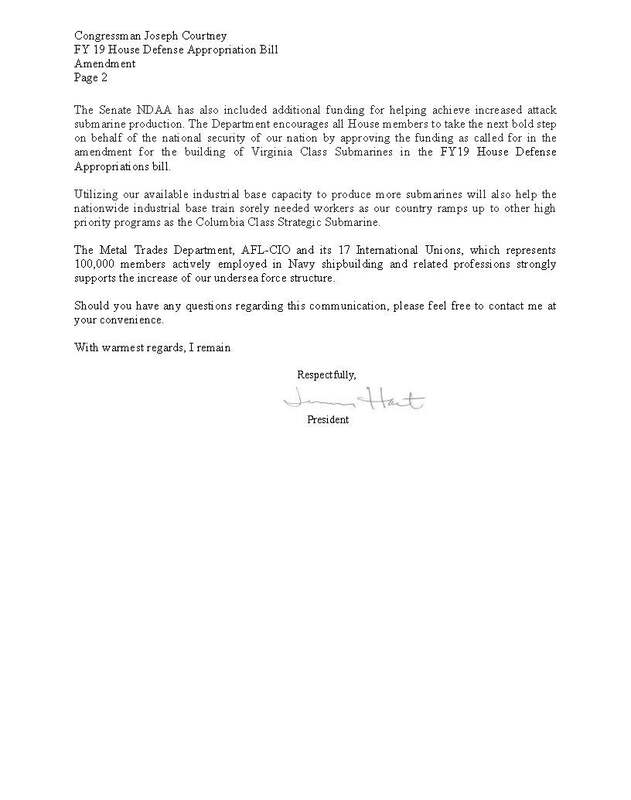 The Department encourages all House members to take the next bold step on behalf of the national security of our nation by approving the funding as called for in the amendment for the building of Virginia Class Submarines in the FY19 House Defense Appropriations bill. Utilizing our available industrial base capacity to produce more submarines will also help the nationwide industrial base train sorely needed workers as our country ramps up to other high priority programs as the Columbia Class Strategic Submarine. Should you have any questions regarding this communication, please feel free to contact me at your convenience.